13 Above: "Can The First Black President Make A Difference ?" "Can The First Black President Make A Difference ?" 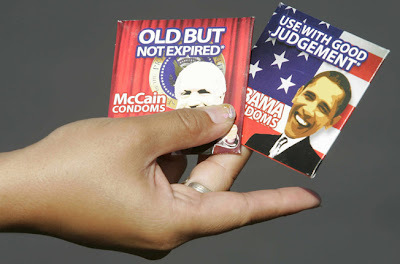 Safety first ... taking politics into the bedroom is never a good idea, but politically-inspired novelty condoms always. 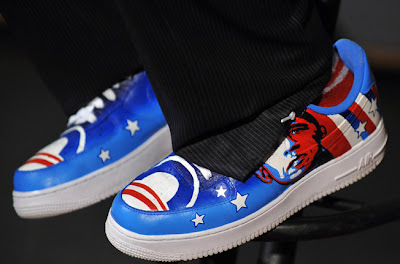 Sneaker peeker ... the singer Taboo's shoes with an Obama paint job. The singer teamed up with George Pajon Junior from Black Eyed Peas and Andy Vargas to record a Spanish version of 'Yes We can' to attract Latino voters to go with Obama. 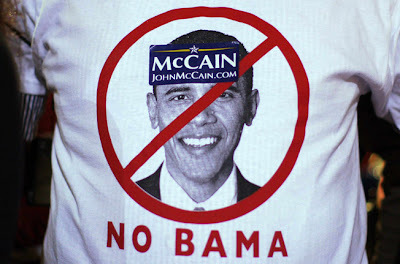 No to O ... Republican Rick Black wears his 'No Bama' t-shirt at a John McCain rally in Roswell, New Mexico. 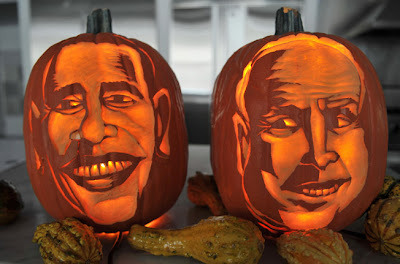 Trick or treat ... two Halloween pumpkins carved into portraits of Barack Obama and John McCain, by New Yorker Hugh McMahon, are displayed. 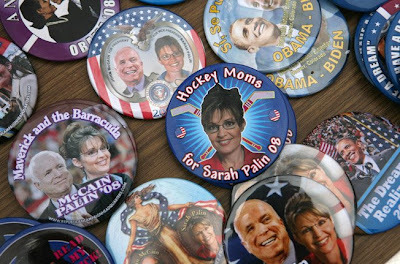 Multiple messages ... a pile of Republican and Democratic badges lie on a table for sale in New York. 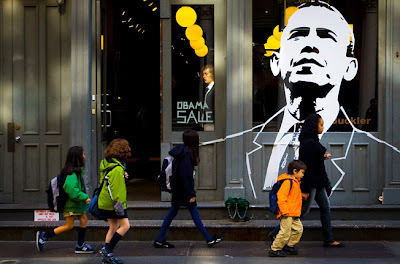 City limits ... a downtown New York store displays an image of Barack Obama and announces an Obama sale. Strike it lucky ... a Colombian woman holds up a lottery ticket being sold in the city of Medellin. 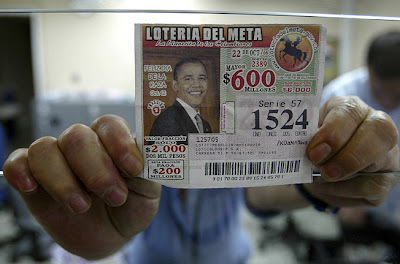 The tickets have been printed with Obama's face to remind Afro-Colombians of the Democratic nominee's African heritage in an attempt to sell more tickets. 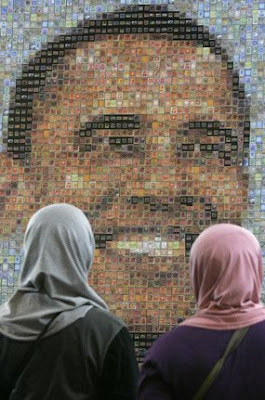 Stamp duty ... two Muslim women look at an image made up from mosaic tiles of Barach Obama, during the Asian International Stamp Exhibition in Jakarta. 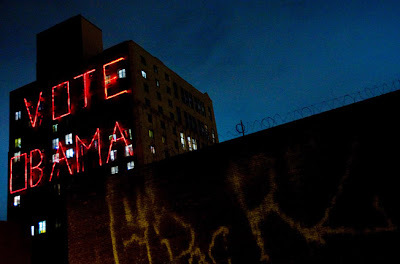 Light up my room ... a super-sized sign screaming 'Vote Obama' shines off the side of New York's famous Domino Sugar building . 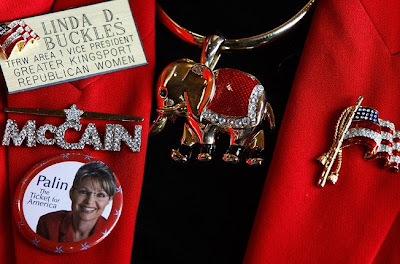 Stars and sparkles ... Linda D Buckles shows off her collection of tasteful Republican themed jewellery during a John McCain rally in in Blountville, Tennessee. 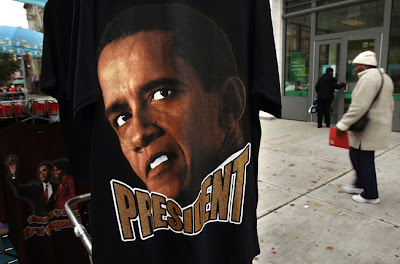 Angel of Harlem ... New Yorkers walk past a stall selling T-shirts showing Democratic hopeful Barack Obama as president, although he looks more like a boxer than a politician. 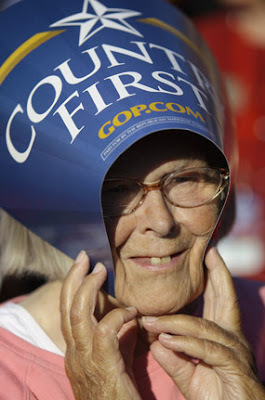 Bend and flex ... Evelyn Moats of South Port, Indianapolis user her McCain placard as an improvised sun shade during a Republican rally at the airport in Indianapolis. 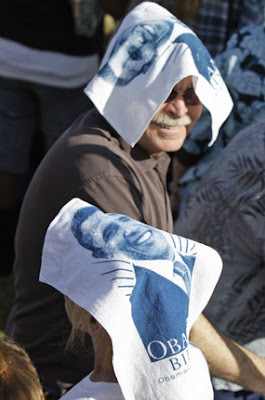 Duck and cover ... two Democratic supporters use their Obama towels to shelter from the sun before a rally at Judy K. Cameron Stadium at Bonanza High School in Las Vegas. 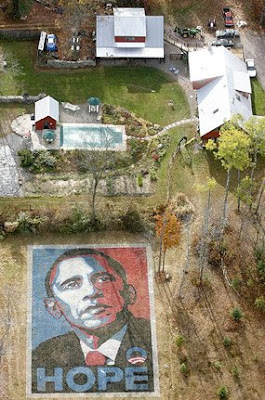 Aerial support ... artists Hilary Ross and her husband Jim Lennox have recreated a giant version of the Obama HOPE campaign poster on their property in rural Shickshinny. 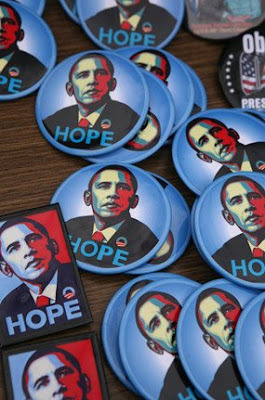 Hope on ... the now iconic image of Barack Obama on a pile of button badges for sale by a sidewallk vendor in New York City. 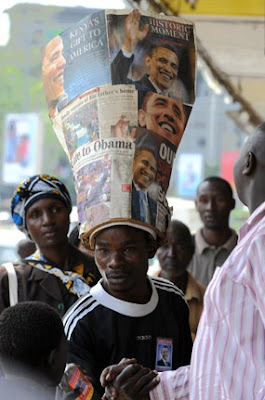 Town crier ... a man in the city of Kisumu, Siaya district of Kenya shows off his Barack Obama hat.